Anaconda, Map of Chile, 1973, Juan Downey, part of Memories of Underdevelopment: Art and the Decolonial Turn in Latin America, 1960-1985 at MCASD. Photo: Pablo Mason. Green anacondas are the largest snake species on the planet. They are known for their highly aquatic tendencies. Ana D. Conda is on loan from EcoVivarium, a local living Museum, and will return to her caretakers following the run of this exhibition. During her stay, Ana is regularly checked on and cared for by Museum staff, as well as friends at EcoVivarium. It surprises many museum-goers to learn that several Pacific Standard Time: LA/LA exhibitions include artworks that are alive. I call these the flora and fauna of PST: LA/LA. In this blog post, I’ll walk you through some of the shows featuring living plants and animals and offer insights into how these creatures add intrigue and meaning to the exhibitions. 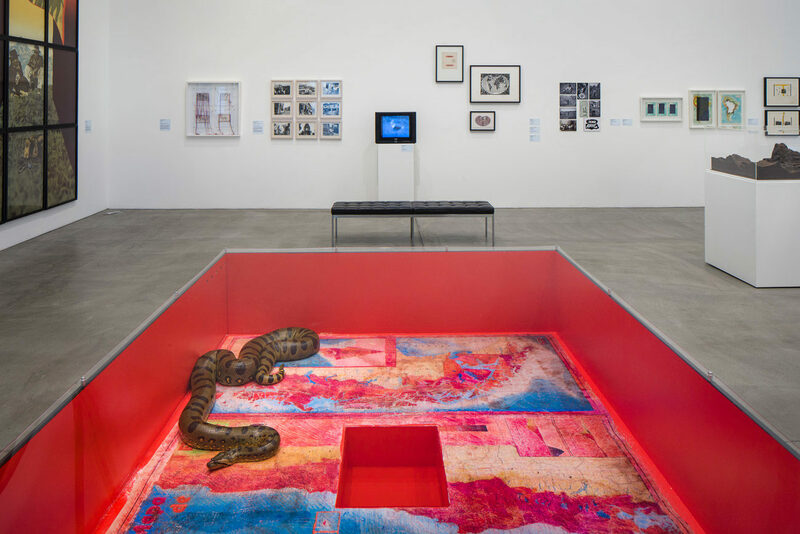 At the Museum of Contemporary Art San Diego (MCASD), the exhibition Memories of Underdevelopment: Art and the Decolonial Turn in Latin America, 1960­–1985 (on view until February 4) welcomes visitors with “Ana D. Conda,” an impressive, 30-foot-long anaconda. Ana the anaconda’s wooden, boxed environment is covered with Plexiglas so that she cannot escape or be touched. And, her enclosure includes a water receptacle and a hidden lower level that regulates heat and humidity so that Ana stays comfortable and warm. As part of Juan Downey’s Anaconda, Map of Chile, Ana undulates on top of a drawn map of Chile on her floor. The installation represents Downey’s criticism of the US-owned Anaconda Copper Mining Company under the dictator Augusto Pinochet. Anaconda Copper Mining moved into Chile in 1922. In 1971, democratically elected President Salvador Allende confiscated the company’s copper mine in northern Chile, claiming the resources for the Chilean people. After the US-backed Pinochet coup overthrew Allende only two years later, Pinochet’s military administration paid Anaconda Copper $250 million in compensation for lost profits. Downey’s artwork, with its symbolism of a large snake crawling and dominating over Chile, was made that same year as an act of protest. Last Judgment, 1985, León Ferrari. Part of Memories of Underdevelopment: Art and the Decolonial Turn in Latin America, 1960–1985 at MCASD. Photo: Pablo Mason. Inhabiting Jaula con aves (Cage with Birds) from the series Excrementos (Excrements) are five finches on loan from the Finch Society of San Diego County. The birds will return to their caretakers following the run of the exhibition. While gazing at Ana, you can hear birds warbling in the galleries. If you follow the songs, you will encounter a birdcage with five beautiful finches. This installation, Last Judgment by Argentinean artist León Ferrari, features a birdcage suspended over various reproductions of The Last Judgment. The reproductions, which include images of the damned and creatures from Hell, are rotated to incorporate versions by three masters: Hieronymus Bosch, Fra Angelico, and Giotto. Throughout the run of the exhibition, the finches defecate on the prints, obfuscating the imagery. 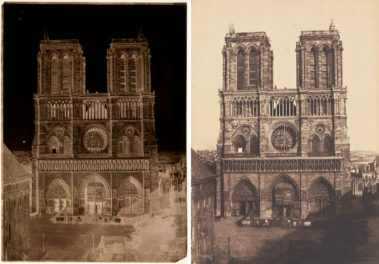 When one print is sufficiently “painted” with excrement, it is replaced by a new print by a different artist. The prints are numbered sequentially and become works of art once completed. The whole process invites the viewer to reconsider the meaning of Hell and the dismantling of the utopian ideas of progress in Latin America following WWII. Believe it or not, the exhibition has more birds! 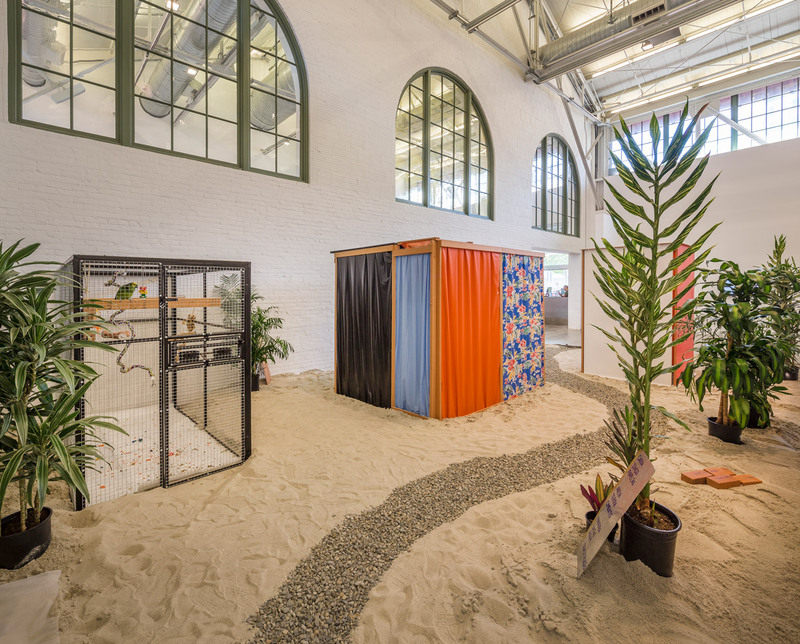 The installation Tropicália, Penetrables PN 2 ‘Purity is a myth’ and PN 3 ‘Imagetica’ by Brazilian artist Hélio Oiticica includes a cage with a brilliant parrot named Mozart. 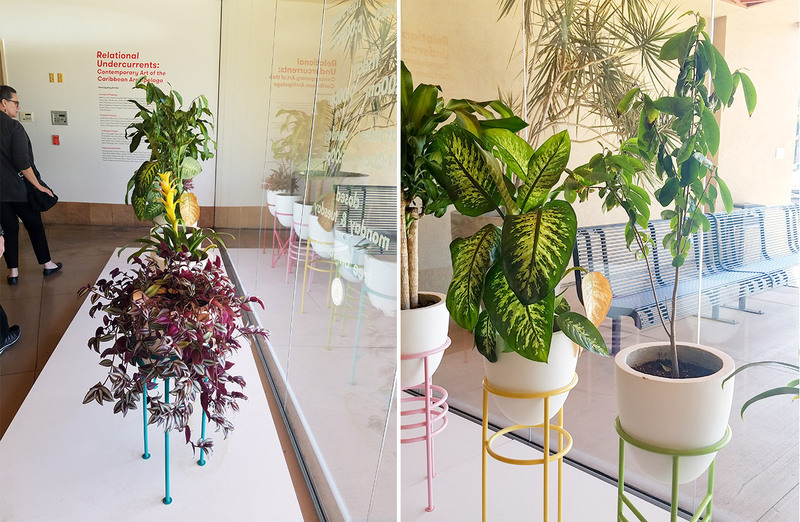 Surrounded by plants and sand, Mozart brings tropical life into the museum. Tropicália is an example of Oiticica’s “penetrable” installations: environments that the viewer can enter, touch, and interact with. Made in the 1960s, these works challenge ideas of modernity by combining “clean” aesthetics of abstraction and modernist architecture with structures that recall the vernacular architecture of Brazilian favelas (slums). Tropicália, Penetrables PN 2 ‘Purity is a myth’ and PN 3 ‘Imagetica, 1966–67, Hélio Oiticica. 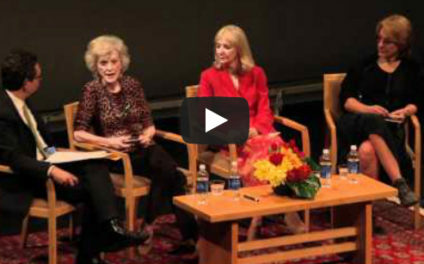 Part of Memories of Underdevelopment: Art and the Decolonial Turn in Latin America, 1960–1985 at MCASD. Photo: Pablo Mason. Mozart is a Blue-Fronted Amazon Parrot and is visiting from the Avian Rehabilitation Center in Jamul, California. Visit their website to find out how you can help all the parrots that call the ARC home (adoptable flock and sanctuary flock), and for information on parrots and the care that goes into providing one like Mozart a home. At the Museum of Latin American Art (MOLAA), you’ll encounter live plants in Relational Undercurrents: Contemporary Art of the Caribbean Archipelago (on view until March 3). Antillas, by Dominican artist Engel Leonardo, is comprised of seven plants endemic to the Caribbean. MOLAA staff scoured specialty nurseries throughout Southern California to find the plants, collecting Boatlily, Dumb Cane, Firebush, Guanabana, Guava, Inch Plant, Mass Cane, and a Vase Plant. The flora represent the Antilles: Cuba, Jamaica, Puerto Rico, Haiti, the Dominican Republic, and the Cayman Islands. Each plant is cared for (some are watered every other day, and others only twice a week); one of them (the guava) had to be replaced because the weather was too dry for it to survive. Leonardo had a similar intent as Oiticica: infiltrate the purity of the “white cube” museum with flourishing tropical life. The plants’ pots and containers carry a seemingly modernist aesthetic with clean minimalist lines, but are in reality geometric Afro-Caribbean motifs, a reflection of the tension between modernity and the tropics. 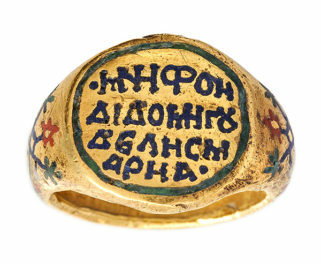 At LACMA, the exhibition A Universal History of Infamy (on view through February 19) includes insects. Futuro do pretérito (Conditional/Pospretérito) (2017) by Argentine-Brazilian artist Carla Zaccagnini provides an introspective look on process and the passage of time. In 2016, Zaccagnini published Brasil, country of the future: a book about a book, a reference to an earlier text by Stefan Zweig, Brazil, Land of the Future, that ignited ideas of progress within the country. Zaccagnini’s book analyzes this “promise” of progress that was not fulfilled by modernity and the ongoing anxieties people have about the future. 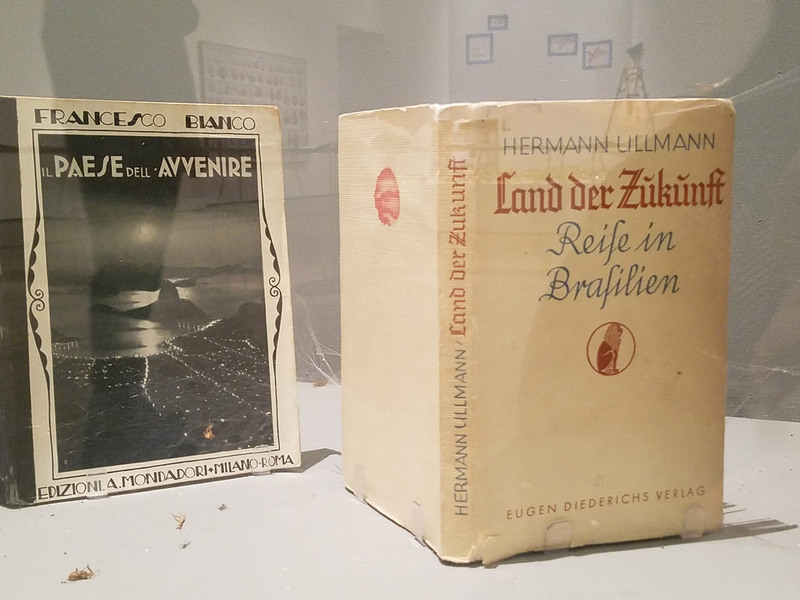 An extension of her book project, Zaccagnini’s installation includes a display case with publications about Brazil, including Zweig’s. The case also contains several spiders (who get fed crickets regularly), and who in turn weave webs in and around the books. The installation evokes both an abandoned library and a display case at the museum of natural history. 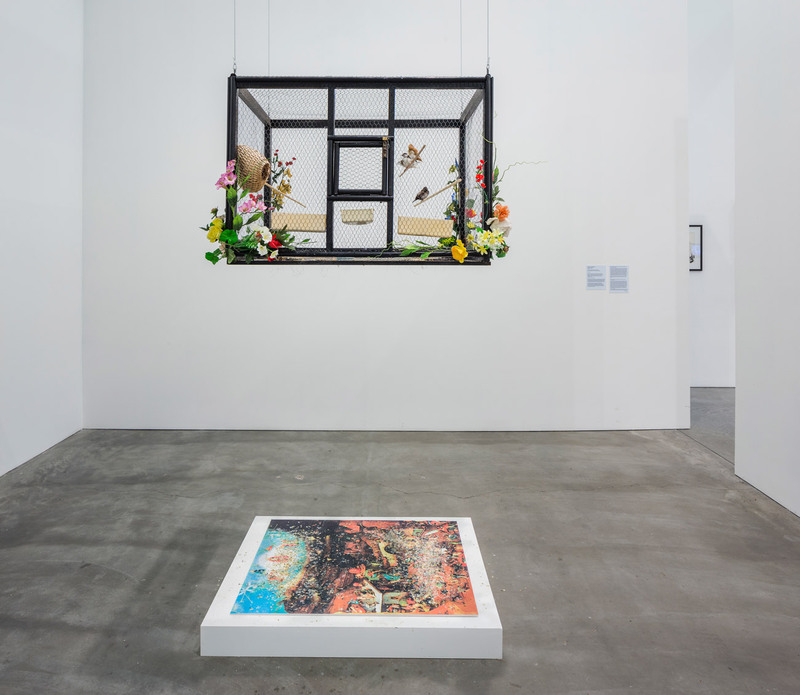 Over the course of the exhibition, the spider webs have become increasingly elaborate, illustrating the idea of the unrealized utopia of modernism in Brazil and the rest of Latin America. Futuro do pretérito (Conditional/Pospretérito), 2017, Carla Zaccagnini. Part of A Universal History of Infamy at LACMA. Several other PST: LA/LA exhibitions featuring flora and fauna have already closed, but they are too intriguing to overlook. 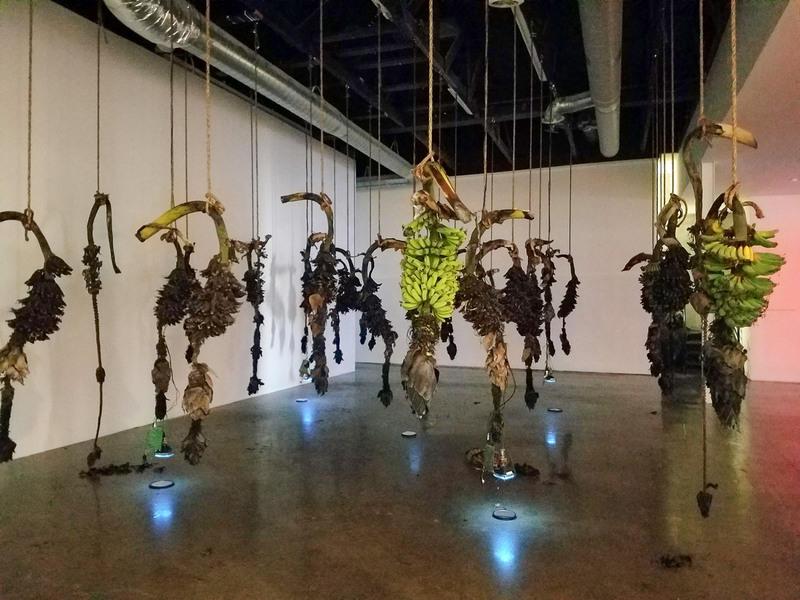 In LAXART’s Video Art in Latin America, the installation Musa Paradisiaca by Colombian artist José Alejandro Restrepo featured hanging banana plants that rotted over the course of the exhibition. It was perhaps one of the most striking of the 60 artworks in the exhibition due to its scale and…odor! Musa Paradisiaca, 1996/2017, José Alejandro Restrepo. Part of Video Art in Latin America at LAXART. Musa paradisiaca is the scientific name for cultivated bananas and plantains—a plant with a history of hybridization, misclassification, and violence (from colonialism and modernization) that can serve as an allegory of the past and present history of Latin America. The tips of the banana plants held small monitors that played documentary footage of military executions of United Fruit Co. plantation workers striking for labor rights. In seeing these decaying plants with accompanying footage, the viewer was not only witness to the cycle of life and death, but also confronted with harsh truths related to modern farming, international economics, and commercialization that cast doubt on history and its official narratives. In Juan Downey: Radiant Nature, a joint exhibition by Pitzer College Art Galleries and Los Angeles Contemporary Exhibitions (LACE), Downey’s 1971 work Life Cycle expressed concerns with living systems and the relationship between nature and technology. Since the 1970s, systems and processes have been a crucial preoccupation of conceptual art, with artists exploring the relationship between natural/social systems and new technologies in what seemed to be the new world order following the social movements of the 1960s. 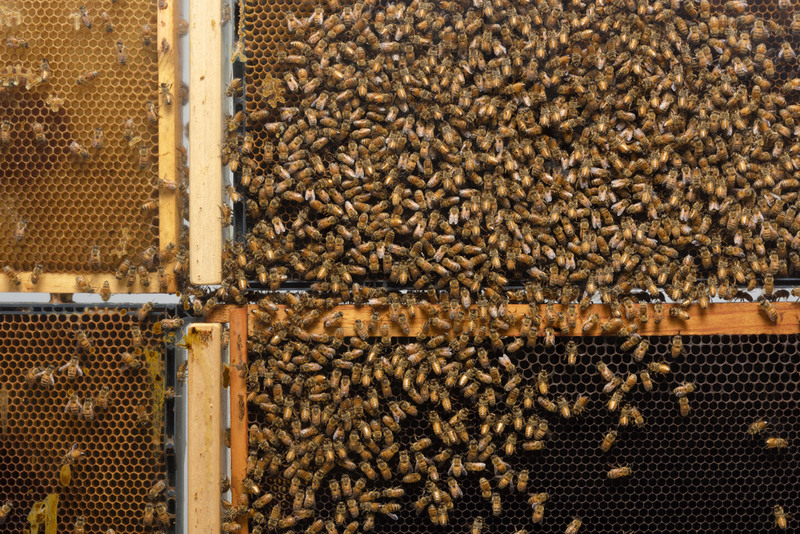 Life Cycle was an example of these interconnections—a work that incorporated electricity, a video feed, flowers, and a colony of live bees that was, I’m sure, a challenge to install and maintain, but an exciting environment inside the gallery that displayed how bees adapt to living with technology (the video feed). It’s been a treat to visit so many PST: LA/LA shows these past few months. I encourage you to visit the shows at MCASD, MOLAA, and LACMA before they close so that you, too, can be surprised, delighted, and inspired by the plants and animals you encounter. I would like to say thank you to all the curators, assistants, and staff members who made these exhibitions and the challenging installations I mentioned possible. Special thanks to Anthony Graham, assistant curator at MCASD, and Gabriela Martínez, curator of education at MOLAA, for generously taking the time to send me “insider information”: Anthony, on MCASD’s collaboration with a San Diego animal rescue to find the right type of bird for Leon Ferrari’s piece, and Gabriela, for her detailed information about the process of researching and maintaining the plants in Leonardo’s work.